Windows, Linux and Android GUI WALLET Please be aware that current GUI wallet shows only outgoing transactions. 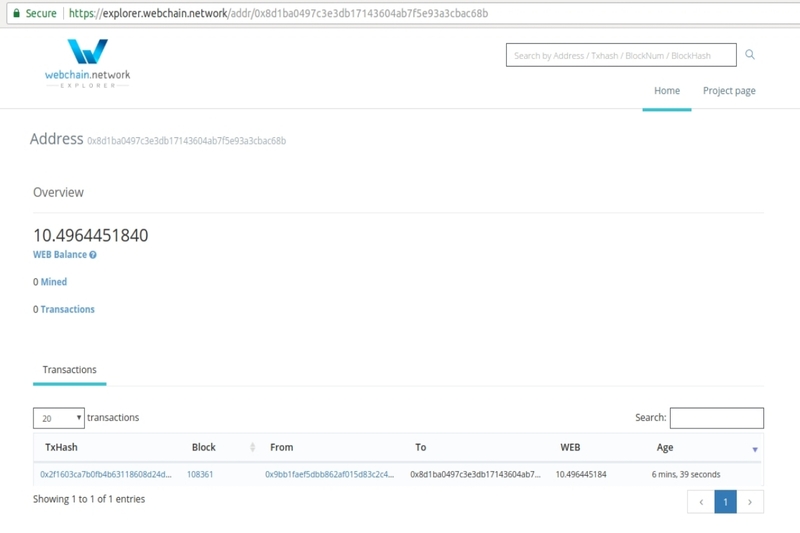 To check history of incoming transactions for selected account, use http://explorer.webchain.network. "FROM KEYSTORE FILE (UTC/JSON)": select this option if you want to import the key from a UTC/JSON keystore file. "FROM PRIVATE KEY": pick this option if you want to manually input the private key. 2.2.1) Click on "GENERATE A NEW ACCOUNT" and set a password to continue. 2.2.2) Carefully read the instructions and click on "Download Account Key File" and store it safely along with your password (this file is encrypted with your password). 2.2.3) Read the instructions given on the screen and click on "next" once you're done with it. 2.2.4) Set account properties: in this section you can create a new account name. 2.3.1) You can also import mnemonic account. You need to type a strong password and generate mnemonic phrase. 2.3.2) Another way is to import the json file located in your keystore account. Follow the instructions given at How to Create or Manage an Account so you can find the json file with your account details. Once you have created a new address or registered your existing one, you will be on the accounts module, where you can manage your accounts, add new ones, send or receive WEB, and see your transactions record. 3.1) Download and Install the miner according to your OS (available for Windows, Linux and Android): https://github.com/webchain-network/webchain-miner/releases. 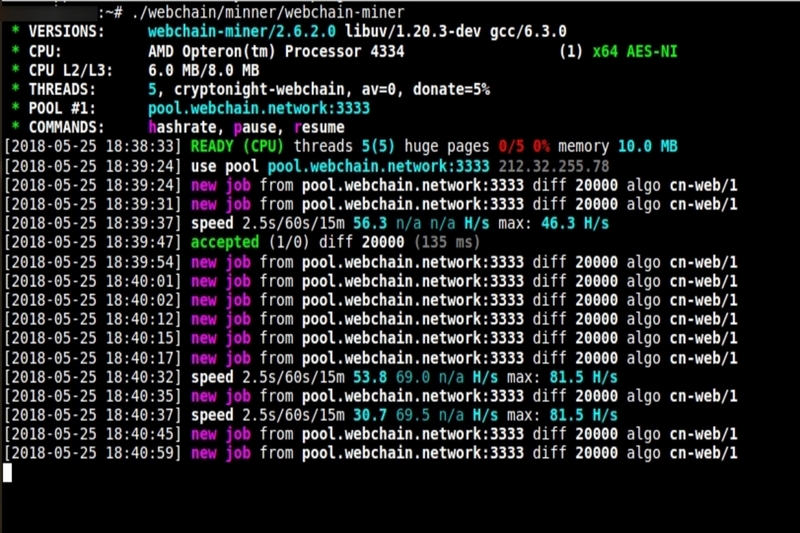 Webchain-miner is a high performance CPU miner for Webchain (WEB). Originally based on XMRig with changes that allow mining WEB. Please be aware that Windows shows virus warnings for all mining software, this is a false positive and you should ignore it (or add it to exceptions and allow it to work). You’ll get information about the miner configurations and the pool you’re trying to mine. Go to Webchain Pool (or any pool of your choice). On the homepage, look for the "Your Stats & Payment History" searching bar, enter your wallet number (including the 0x prefix). After the miner has sent the first accepted share, you will see realtime stats on the upper part of this page. This means that you have indeed mined some coins, but transactions are still waiting to be confirmed. Pending Balance: once mining transactions have been confirmed, the coins already belong to the user. Those coins are going to be sent to your wallet according to the pool payment schedule if you have reached the respective threshold. Total Paid after the pool payment schedule is run, this shows the balance of coins that have already been sent to your wallet. 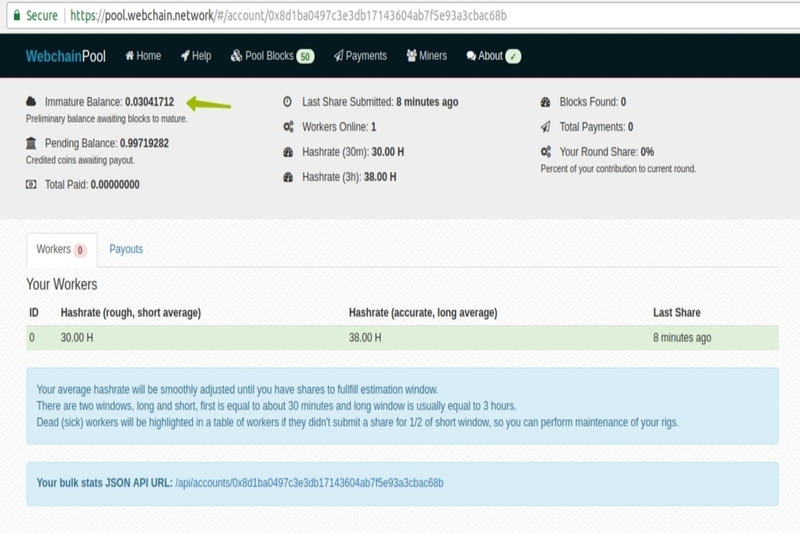 Last Share Submitted how long ago your miner(s) submitted an accepted share to the pool. Workers Online shows how many devices are mining to the same wallet. Hashrate shows the total mining hashrate of all the devices associated to a same wallet. Blocks Found shows how many blocks were found by your share. Total payments shows how many scheduled payments have been completed. Your round share shows how much you’re contributing to the block solution using your worker(s). You can always check your coins balance visiting https://explorer.webchain.network. Type your wallet number on the upper right corner and you will see how many coins you’ve earned. There are other parameters that can be set up in config.json: number of threads, max-cpu-usage, etc. 1. Click on "SEND" button. 2. Enter the recipient’s Webchain account address including “0x” prefix or choose it from the Address Book. 3. Write the amount of WEB you want to transfer and click on "CREATE TRANSACTION". Average time needed for one WEB transaction verification is 10 seconds. Then you will need to enter your account password and click on "SIGN & SEND TRANSACTION". When the transaction is completed, you will see it on the history of transactions with the status "Success". Before that, the status will be "In Queue".